Free Picasa by Google instantly locates and organizes all the pictures in your computer! RamBooster itself is and will always be FREE. this program, you can now easily do it via PAYPAL. You can even donate with your credit card. versions of RamBooster in the future. - Version 2.0 - Major update. The "What's new"-list is way too long to write here. Works now also with XP/NT. Full support for XP Themes etc. etc. Most of the code has been completely rewritten. The GUI is still the good old RamBooster GUI to make things easier for those who have been using Rambooster for years. - Version 1.6 - Uses less resources than EVER, only about 1% of total. This is much less than any similar program. -Uses less memory than ever. About 80 kb less than previous version. Also the .exe size is about than 80 kb smaller. - I tested various methods to tell the user visually, that RB is optimizing the memory while sitting in the tray. (I received hundreds of e-mails about people wanting to actually SEE this happened) So I had to add an "animated" tray-icon. This increases the memory usage with about 20kb, but hey guys...you wanted it this way. There is also an optional pop-up box that is shown when RB is doing its job. - Fixed a "feature" that caused the slidebar position not to be saved if rebooted without exiting the program + much more technical stuff you don't want to know about. - Version 1.5 - Loads super-fast! Also the optimization method is faster. -_Lot's_ of internal improvements, very few of them are visible, you just have to take my word of it; RB works much nicer now. -No more splash-screen. -Optimized the code; .exe-size is about 30kb smaller. -No more html-help files, because TOO many people has difficulties with them, because they had to be installed to exactly to right folder. -Fixed incorrect hint-text on "Toggle mode" button. -Program supports now also large fonts, to make things easier for those with huge monitors. - Version 1.41 - Received some e-mails asking if I could remove the menu if RB is running in the Monitoring-mode. Done. Better helpfile, contains more info about resources etc. Optimized the code a little bit. If nothing _fatal_ is found in RB, there will be no more updates in the few weeks, because I am working with a HUGE commercial project right now, so I guess, there is not much time to put for RB. After the project is finished, it is time to improve RB again. ALSO INCLUDING THIS INFO HERE: This does not actually belong here, but I have added it into download-page,and still I get e-mail about this : HTML Help-files DON'T work if the zip is not unzipped correctly. The "Use Folder info" MUST be selected when you unzip Ramboosterzip.zip. --------- Made the interface nicer. Added groupbox-components to separate the parts of the screen. Added "Monitor Mode". By clicking "Toggle mode", RB goes to a monitoring mode, a little form that is always on top, to make it easy to monitor cpu and ram-usage. When in monitor mode: -Double click the groupbox to show the full-size screen -Alt-S to send to tray -Alt-T to show full-size screen -Alt-O to run optimization. Added "Clear Clipboard" function New splash-screen by Jagerdude@hotmail.com. --------- Version still 1.4 Programmed the part that shows the splash-screen again. The previous coding caused error on certain systems (Cyrix and...?) if autolaunched minimized, and also caused problems when minimized. (received 1st mail about this yesterday, 3 more today, this was something that had to be done quickly) Optimized the code a little bit (the cpu-monitor part) Changed the icon, the new one looks better on the desktop. ------- Added selection to restart windows without rebooting. Program is re-coded using Delphi 4.0 Pro. ---------- Added Quick reboot selection in "File"-menu, to use if Windows needs to be rebooted. Use with care, no confirmation asked !!! ---------- Version 1.21 just minor improvements. New splash-screen by Jef Bardsley. Thanks Jef ! :-) ( http://www.ultranet.com/~sandif) Added 1 more selection into Preferences, amount of ram to free when alarm-level is reached. Slidebar position is also saved into ini-file. ---------- Awarded with FREEdom Star Award !! ---------- Ranked "Best" by NONAGS.COM !! ---------------- -Version is still 1.1 -Including the version 1.2 help-file into .zip, slightly modified though. Working hard to give you people version 1.2. There are going to be a lot of changes in the program code of version 1.2. Most of them are not visible to the user, but they make the program run even better. IMPORTANT : If You decide not to use RamBooster anymore, make sure that the selection to autorun RamBooster is unchecked before you remove the program. The only proper way to make this autorun-feature is to use registry and if you delete the program before unchecking the option, the value is left in registry. If this has already happened you can manually remove key 'RamBooster' in: HKEY-CURRENT_USER\Software\Microsoft\Windows\CurrentVersion\Run DON'T DO THIS UNLESS YOU ARE ABSOLUTELY SURE WHAT YOU ARE DOING!! Doing something wrong may corrupt your registry and you may be forced to re-install Windows. 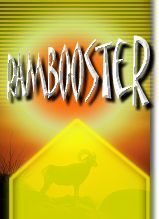 RamBooster does not manipulate your system in any other way, since it is stand-alone, and I think that this program-type shouldn't change anything in your system, but in this case I could not avoid it. -There is also self-exctracting zip-file available on the website.